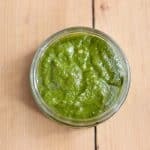 Pesto is one of those amazing sauces that can bring so many things to life. You can make it all year round, but making it with the freshest summer basil, you’ll know why it is best in summer. This recipe is really about ratios, which is why I haven’t put exact measurements in – use your own hand as the measuring cup. Peel and crush your garlic. Lightly toast your pine nuts, if desired. Put the basil, pine nuts and parmesan in the blender along with the garlic and blitz for a few seconds (about four) to start the process off. Add about a tablespoon of extra virgin olive oil, blitz for a few seconds more. You are looking for the oil to hold the pesto together and make it into a sauce, so add a bit more if it looks too dry, then mix again. Continue this process until you have a fairly thick sauce consistency. Taste, and add salt and pepper – or a squeeze of lemon juice – as required. If you have a mortar and pestle, crush it up with the salt and pepper, then add in the rest of the ingredients and crush them together, slowly adding the oil until you have a loose paste. Taste and season – or add a squeeze of lemon – as required.